One of the audience members summed it up precisely. You should feel as though you have done a couple of rounds in an emotional ring after a good night in the theatre. This new production of War Horse at London’s National looks just the job: a boy and his horse, WWI, great puppets, and a fine, fine story. Wish I were there. 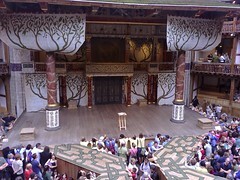 Those wonderful one-penny ticket audience members who stood in the yard of Shakespeare’s theatre were a rowdy and indiscriminate lot by all accounts. Hamlet had a few words to say about them. They were, “for the most part, capable of nothing but inexplicable dumb shows and noise.” But hey, they bought the ticket, and supported the company. Today the groundlings at Shakespeare’s Globe Theatre in London pay considerably more than a penny for the privilege of standing in the yard. They love theatre just as much, but maybe aren’t as hardy as their ancestors. Whenever possible, they attempt to find somewhere to sit. Sadly, the eagle-eyed stewards are on the job and keep the groundlings where they belong … standing … in their place. Welcome to Groundling. This is the first post of what I hope will be many. I wanted a place to write about my love of theatre and good acting with others. Since I was introduced to theatre as a child, I’ve never found anything more thrilling than spending a couple of hours in a big, dark room with a bunch of strangers, ‘dreaming out loud in front of ourselves.’ I think Groucho Marx and Martin Esslin said something pretty similar about the theatre experience. Even if they didn’t, watching great acting (preferably live) beats the heck out of anything else for me. I plan to post fairly regularly, and as the mood takes me. It’s a reflective (maybe even chatty) spot for me to drop by. I hope you will join in.